Wyoming Prosperity: Are We Socializing Health Care in Wyoming? From now on to Labor Day, I will be cutting down blogging from four articles per week to three. This allows me to do more research for each article and to catch up on problems and matters that are of more long-term nature than during the "political season". Once we get to the fall I will return to the four-per-week schedule. During last week's analysis of the latest jobs numbers for Wyoming I discovered that most of our reported hospital employees, according to the Bureau of Labor Statistics (BLS), work for local governments. I found this odd and decided to go back and take a closer look at those particular numbers. The BLS data is not complete. We can retrieve data for private-sector hospitals, but only for 46 states and the D.C., but when it comes to government-run hospitals there are only useful numbers from seven states. Nevertheless, with these limitations in mind, the conclusion from the data review confirms my suspicions: as a state, Wyoming is essentially going against the national trend. Out of these 47 jurisdictions, we rank 41st, with an average growth rate of 0.6 percent per year. * However, as Figure 1 showed, all of that expansion took place before 2010; since then there has not been any growth in private-sector hospital employment in Wyoming. By contrast, other states have seen an unweighted average growth of more than 1.1 percent, with the strongest growth happening in 2015 (1.7 percent) and 2016 (2.5). Our hospitals have also hired people, but it has been on government payroll. On average our government-run hospitals have expanded staff by 2.2 percent per year since 2010. As we can see, all the other six states have a much larger share of private provision of hospital health care than we do, at least when measured in terms of relative employment. 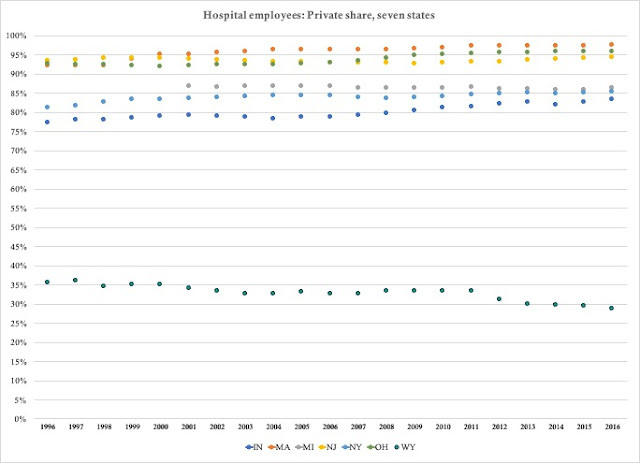 While the share of private hospital employees is slowly declining in Wyoming, it is slowly increasing in Indiana, Ohio and New York (of all places). In Massachusetts the private share is so high, in excess of 97 percent, that it is almost impossible for it to rise any further. The data reported in Figure 5 is of limited use in interstate comparisons, but if we think of it as a first glance rather than a definitive answer, it is easy to see that there is clearly a need for more research. There are other databases that can provide a more comprehensive answer. In the meantime, let us again note that there is a trend in Wyoming where government appears to be slowly monopolizing the hospital sector of the health care industry. This trend is disturbing; one need not look further than to Canada to understand what we can expect if we go too far down the health-care socialization route. We are not there yet here in Wyoming, but the combination of a growing dominance of government hospitals and an almost non-existent market for private insurance is enough to merit some serious questions to our state lawmakers. We will return to those in the next week or two. *) For some of these states, data is only available for part of the time. For Mississippi, data is available since 1998 and for Michigan and South Carolina since 2001. The numbers reported in interstate comparisons here are adjusted for these differences.